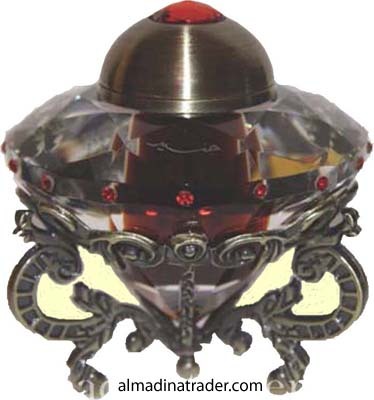 Attar Al Oudh by Rasasi Perfumes is an oriental exotic concentrated feminine perfume. The new and intense olfactory combination generates freshness instantaneously. All the notes in the fragrance flow in perfect harmony and create a feeling of contentment. This futuristic and innovative fragrance is bound to attract and hypnotize the wearer. Our fragrance was made for the body, not the air. World famous Rasasi concentrated perfume oil "Attar" is alcohol free, safe to use. Comes in a transparent beautiful decorated glass bottle. Anointing rod is attached to the cap for ease of use. Rasasi has been creating some of the best and most exclusive fragrances, which have established a worldwide reputation for quality, luxury and elegance. Rasasi's Oriental and Occidental perfume lines have found wide acceptance and preference within a wide customer base across the world. The secret to the success of Rasasi is "Quality product at excellent value." Elegance, quality, competitiveness and innovation are synonymous with Rasasi, while creating the finest perfumes that epitomize quality and sophistication, and moreover a fine mastery over the art of blending fragrances. You get the Value for your Money. The perfume is manufactured in United Arab Emirates. Thank you for considering our products.